One of the things that bothers and engages everyone in the world is reward and recognition. Somebody does outstanding work and no one recognises it, the person’s motivation just sinks but a pat on the back gets him/her energised. Government awards, Public awards like the Nobel prize etc are much coveted as they provide recognition for outstanding work by a large audience. Till September 2016, the coveted Padma Awards by the Government of India were given out on the basis of nominations by government authorities – state and central ministers, Members of Parliament and different departments of the Central government. What? 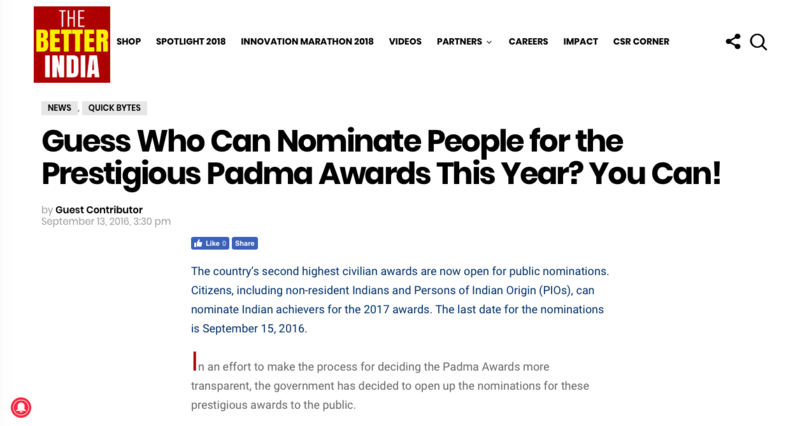 any Indian citizen, NRI and PIO could nominate a person he thinks should be getting the second highest civilian award for outstanding public service? And suddenly with that SMALL change we got to hear of people who had contributed significantly to communities/arts/science etc from every part of our country. Just look at this year’s awardees and the next two pictures show many names that we had hardly heard of and some names that we know. 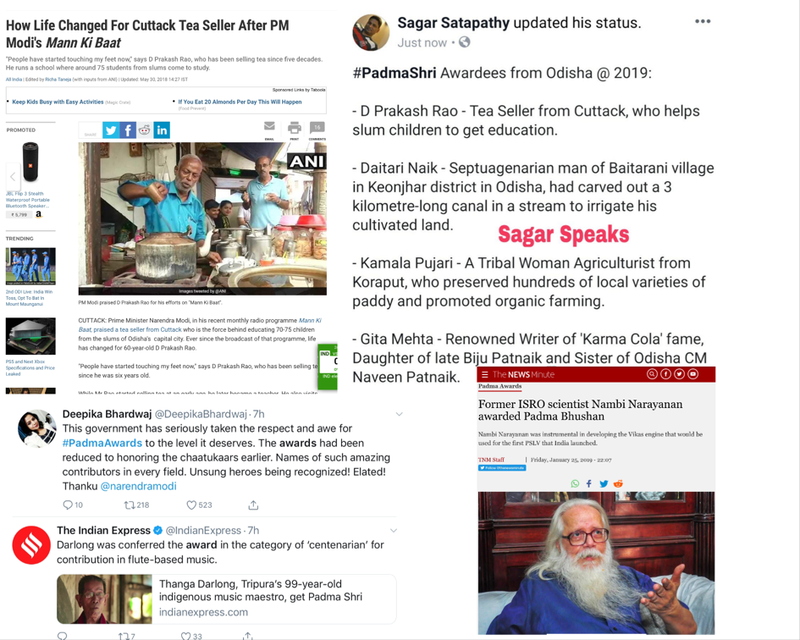 A tea seller getting a Padma award for educating children? 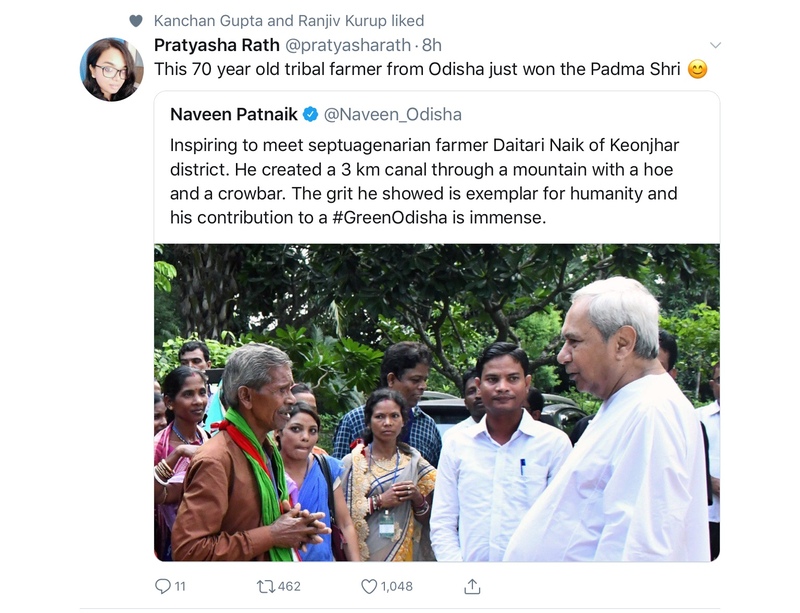 A tribal farmer who dug a 3 km long canal by himself getting a Padma award? From the awards given out this year, I am personally thrilled that Dr. Nambi Narayanan of ISRO was awarded the Padma Bhushan. This man’s contributions not just went unnoticed, but nearly twenty years of his life were made hell as he was wrongly implicated in a spy case. This is vindication and just praying that in some small way the pain of those years is wiped out with this award. Read about his harrowing tale in his book “Ready to Fire” and my blog – Life Review – Ready to Fire. And Mr. Nehru didn’t descend from heaven (or hell) to make this SMALL change ! Nor did any of his dynastic successors … it was done by this Modi government. I will vote for Mr. Modi because he has truly recognised the heroes of our country. Its the intention behind opening the Padma awards to the public. Earlier it was the “yes” men and women and sycophants of the FAMILY that cornered all the accolades with a smattering of awards going to those that deserved them. The Padma award also became a political tool to award those that could sway public opinion in your favour or get you some votes. 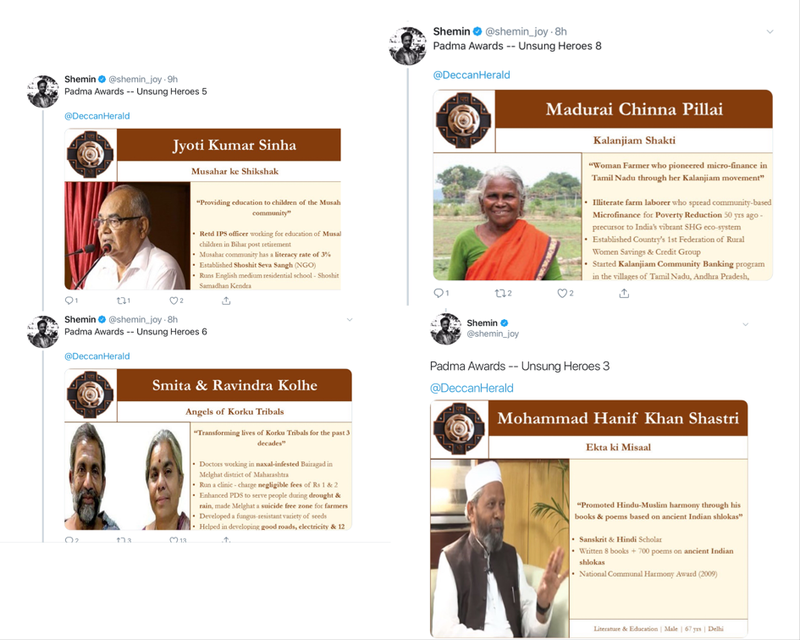 One can argue that this government has also chosen a few who will benefit them politically, but majority of the Padma awards in the last three years have gone to unknown people who have made a huge difference to our country. The CONgi ecosystem would not have touched a Prakash Rao because he is just impacting 70 students with his work or a Mohammed Hanif Khan Shastri who says it all with just his name …. thats the difference. Congratulations and respect to all the Padma awardees and hope to meet some of the unsung heroes as we travel for ShikshaDaan.